A scale of simple numbers unnerves us when we think about earthquakes, as Pacific Northwest residents have been prone to do lately: Whew, just a 3. Oh man, a 6. Good God, an 8? That this scale for measuring temblors is logarithmic only amps up the drama. This is — or was — the Richter Scale, whose fearful numbers live on even if the name does not. And that’s about all we know, most of us. But who was Richter, and how did it all come about? 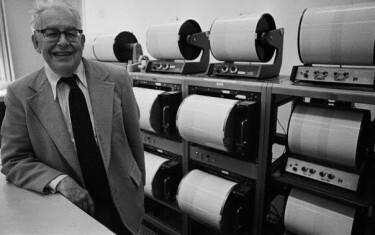 Joe Janes, a professor in the University of Washington Information School, got to wondering, too, and so Charles Richter (1900-1985) and his 1935 “Instrumental Earthquake Magnitude Scale” quickly became the latest installment in Janes’ Documents that Changed the World podcast series. Richter was a theoretical physicist who more or less drifted into seismology. He started by measuring earthquakes to find their location, then discovered that the shaking from a quake reduces as you get further from the site. Richter began using his scale in 1932 and published it as a paper in the Bulletin of the Seismological Society of America in 1935, where it seems to have caught on. Janes describes in the podcast how Richter’s work was widely used for a time, then superseded by the 1970s. Fancier measures came along, but they were designed to be consistent with Richter’s work. But Richter had an interesting, if challenging personal life as well, Janes found. Aside from having his own living room seismograph, he was also a poet and may well have had Asperger’s Syndrome. And oh yes, he was a nudist. 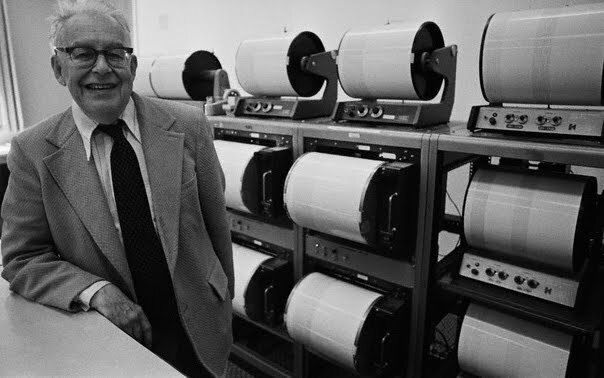 Notwithstanding all this, “Charles Richter was one of the handful of people responsible for coalescing seismology into the scientific discipline it is today, and later in his life was a leading voice in awareness of earthquake preparedness and improving building codes.